Mr Alfred Sharpe has just returned from a three weeks’ sketching tour in the Bay of Islands district, with a well-filled portfolio of sketches, and with a number of orders from the residents of that district. The sketches comprise views of Russell, Paihia, Waitangi, Ngaheiu, Pakaraka, Pouerua, Ohaeawai, Waimate, Kawakawa, and the Waiomio caves and rocks; and though not striking views when compared with the rugged grandeur of the South, still they reproduce the peculiar features of the great volcanic plateaus, and the bush and coast scenery of the North in a pleasing and truthful manner. 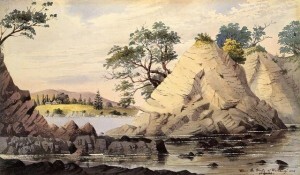 These views will be exhibited to the public as soon as the artist has worked off the orders he has been favoured with, and has had time to transform them from sketches into pictures. cited in Roger Blackley, The art of Alfred Sharpe, Auckland City Art Gallery and David Bateman, 1992, pp 61-62.